Why a Year 7 to 13 School? St Bernard’s College combines the best features of primary and secondary schooling for its students in Year 7 & 8. They have both a home-room environment and the extended specialist resources normally available only in secondary schools. This model also benefits the older boys, since the primary approach of mixed ability teaching emphasis on the form class and strong pastoral care are maintained throughout the school. The Junior Studies Department is housed at the Anderson Grove end of the College campus. Students’ learning and welfare are supported by a Director of Junior Studies and Dean of Years 7 & 8. The full core curriculum is taught to all students. Art, Dance, Drama, Mathematics, Music, Physical Education, Religious Education, Science and Technology are taught by specialist teachers. Assistance is available for those students with special learning or behavioural needs. Students may learn a musical instrument of their choice through the music tuition programme. Information Technology and Computing courses are available for all students. The Technology curriculum is taught in modern well-resourced facilities. From Year 9, students are taught by specialist teacher for their full programme. They are timetabled to move to different rooms and teachers each period. In Year 9, students study English, Mathematics, Religious Education, Science, Social Studies, Technology, Physical Education, Art, Music, Health , and Computing. Year 9 students have the choice of studying one language. As students advance beyond Year 9 they progressively get more options from which to choose in their course of study. In their senior years students are offered a wide range of subjects catering for diverse student interests and differing academic abilities. All Students undertake a programme in Religious Education. The Religious Education programme is taught according to the Religious Education Curriculum authorised by the New Zealand Bishops’ Conference. This curriculum teaches students what the Catholic Church believes, celebrates, lives and prays. The curriculum also assists young people to develop a relationship with God and to be living witnesses to the truth of the Gospel of Jesus Christ as members of the Catholic Church, always recognising that this depends on each person’s free faith response. Through the Religious Education Department students participate in retreats, St Vincent de Paul Society and Roman Catholic initiation programmes. Leadership oppurtunities and the Young Catholic Leaders group in the College. Extension of Gifted or More Able Students - students who are gifted or more able are given opportunities for extension and enrichment. Students in Years 9 & 10 are placed into classes with consideration given to their academic abilities. In Years 11 & 13 a wide variety of options cater for students of all abilities. There are many opportunities for students to enter competitions in different subjects throughout the year. We are proud of the excellent results our students gain in these competitions. St Bernard’s College makes a very strong commitment to English for Speakers of Other Languages (ESOL). Those students who need extra assistance with English (as a second language) are assessed and an appropriate plan is put in place. In Years 9 & 10, students who have language difficulties are provided with additional English tuition. Our Learning Support department is well resourced and has a caring family atmostphere. Students are carefully assessed to determine what assistance they require with their learning. Teacher aides help students in their learning. Individual education plans are set up for those students who need academic or behaviour management assistance. 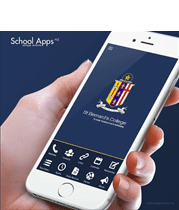 To keep up to date with all that is going on at St Bernard's College download the school app from the App Store or Google Play. Copyright St. Bernard's College 2019 | website by fahrenheit.